Got a call on the show this past week that made me realize that I needed to clear up part of my orchid recommendations. Years ago a listener called the show and reported great results using Garrett Juice, but he felt like it had killed some of his orchids. We responded quickly and added the warning to the label and at the same time tested Garrett Juice on many orchids. We sprayed it, drenched the roots, and used light and heavy applications. Nothing - no damage. Not only did we cause no damage with the Garrett Juice, the fertilizer value provided excellent growth and flowers. We tried both commercial products and homemade solutions. We have tried to remove this warning from all our documents, but it probably still lingers in a few places. During the years, we have continued to try to replicate Garrett Juice damage to orchids. My wife Judy has been an important part of this research. She became an avid orchid grower several years ago and has had terrific success growing them and getting impressive re-bloom on several varieties. The only products that have been used are Garrett Juice, Garrett Juice Plus and Alpha Bio's product called Bio S.I.. Use both products per label directions and usually once a month. So, continue to enjoy your orchids (or get some to try) and fertilize with Garrett Juice or Garrett Juice Plus to get them to come into bloom; don't fertilize while they are in bloom; provide plenty of light, and water every few weeks but avoid overwatering. Another little trick Judy uses is to put a handful of wine corks in the bottom of the decorative containers so the pots holding the orchids have air space under the roots and the roots don’t sit in water. I have also been questioned about the benefits of mycorrhizal fungus on orchids. 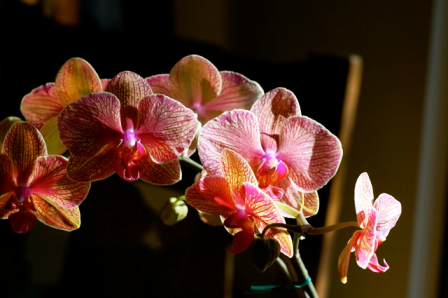 Orchids very definitely benefit from mycorrhizae and have it on their own when in a healthy condition. Synthetic fertilizers destroy it. Coffee grounds are an excellent organic fertilizer, especially for orchids and African violets. Old diluted coffee can be substituted for the compost tea in the Garrett Juice formula. To discuss this newsletter or any other topic, tune in Sunday 8am -11am CST to the Dirt Doctor Radio Show. The phone number for the show is 1-866-444-3478. Listen on the internet or find a station in your area. JOIN the Organic Club of America! Memberships are also great gifts.